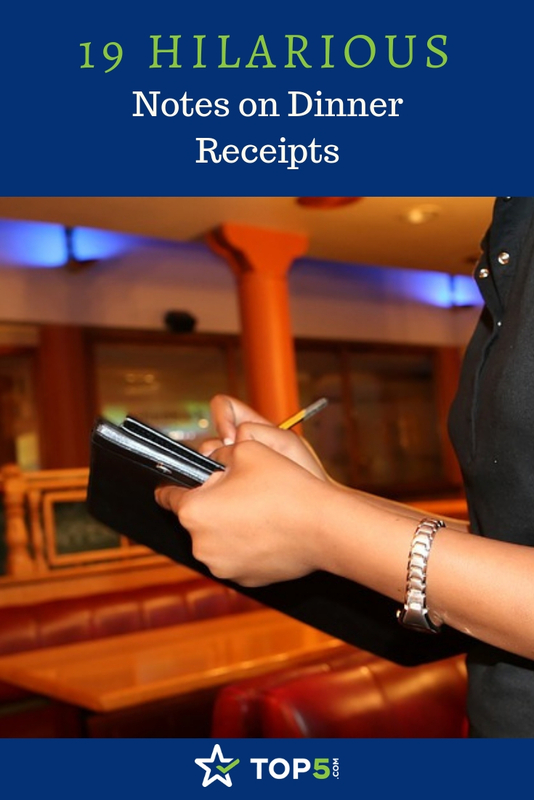 Let’s forget about leaving reviews on Facebook or comments on a restaurant’s website for a while and let’s go back to doing something much simpler: writing notes on dinner receipts. 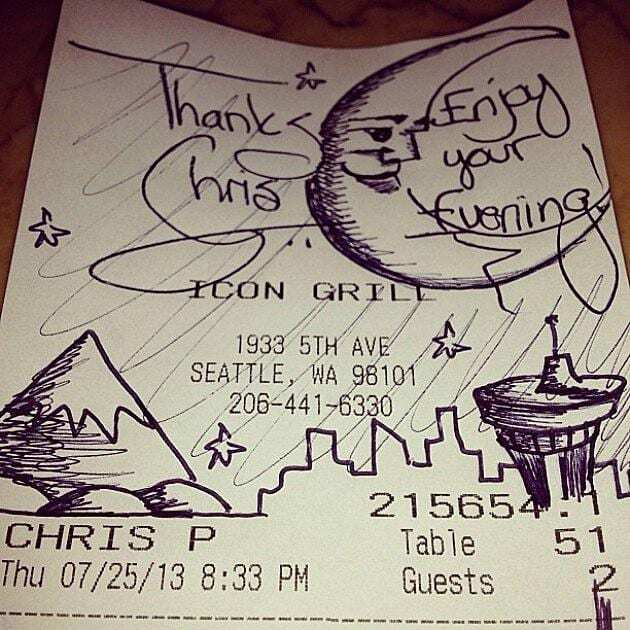 Whether you want to congratulate a waiter who made your night out an utter success or want to pass a message to management, leaving notes on dinner receipts can be more rewarding, as it feels more personal and real than a faceless or nameless review online — although we know those help a lot as well. 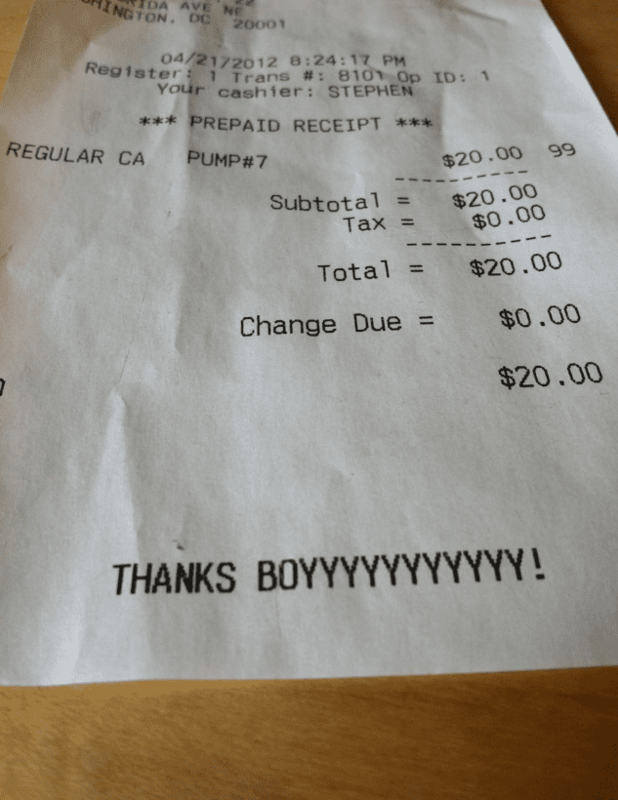 Leaving notes on dinner receipts goes both ways. 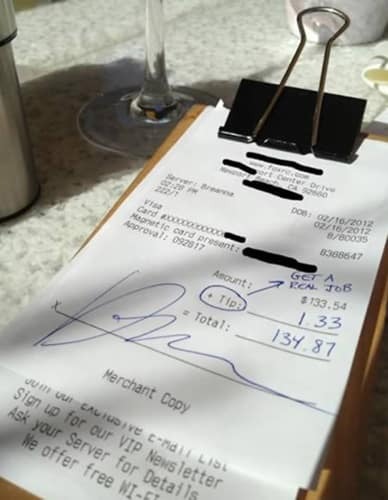 Restaurants nowadays want to have fun and connect with their customers. Their latest whim? 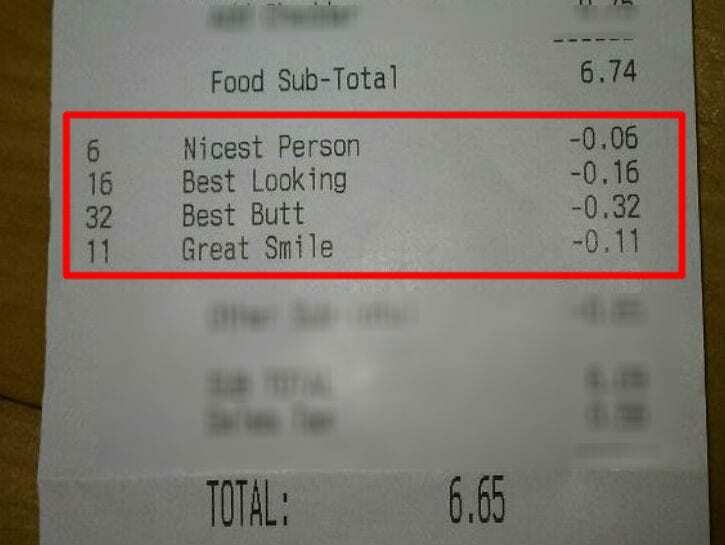 Adding side-splitting notes to the bills they hand to curious customers. These messages can be discreet, written in big bold letters, or hidden between the meals of the order. 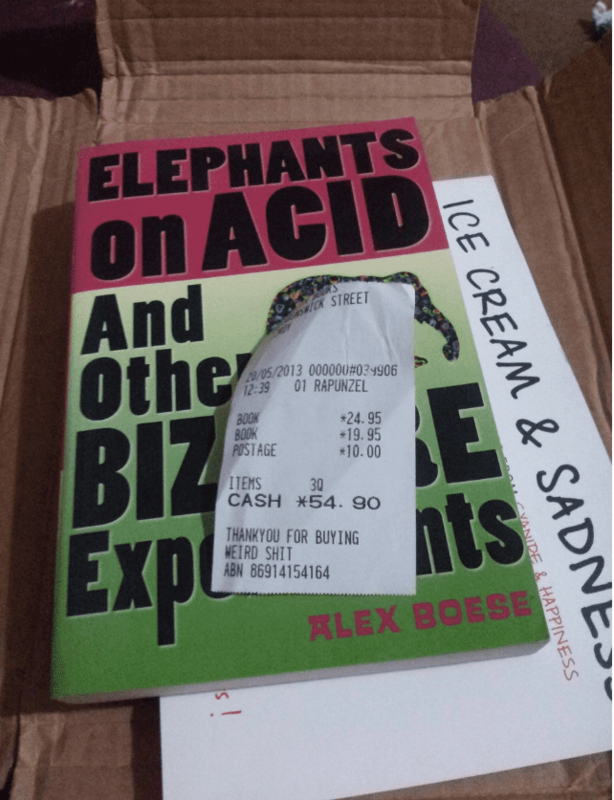 We rounded up the best notes on dinner receipts and bills that will make you smile, laugh and sometimes wonder how on earth management agreed to print out these notes! 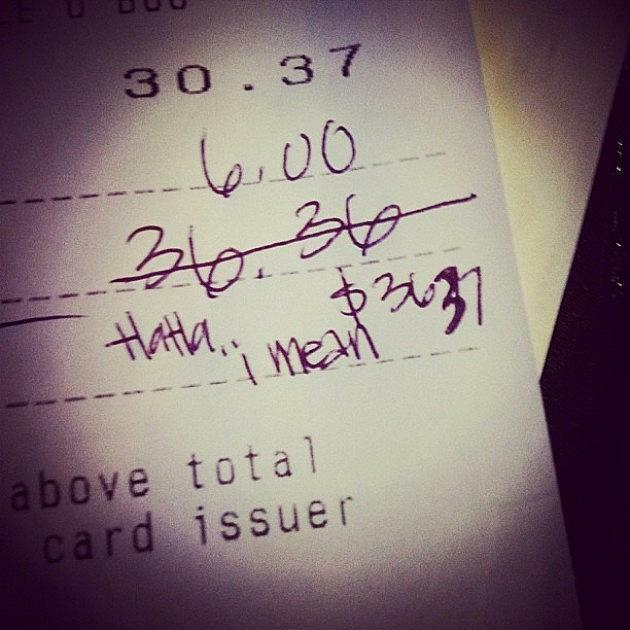 The notes on dinner receipts usually thank people for their orders or ask them to come again. Others see that small piece of paper as an opportunity to make people laugh their hearts out. 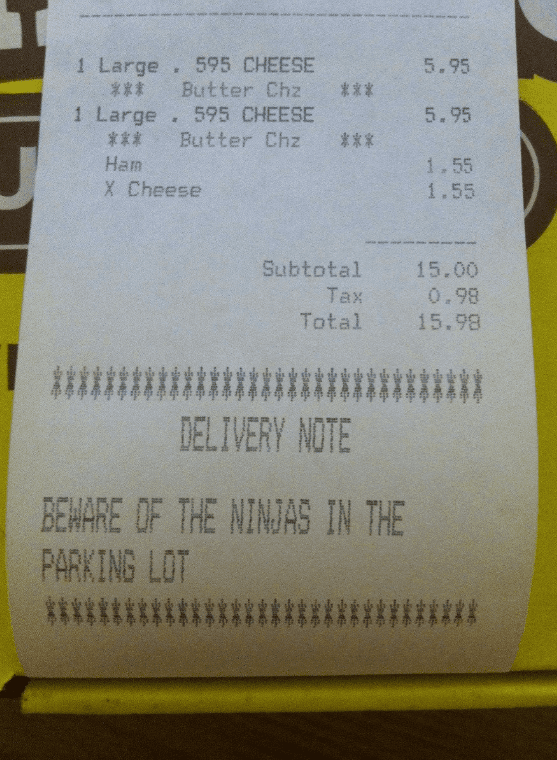 Honestly, we would remember a restaurant more vividly if we read a note like this ninja one. 33.) Thank You, But Why? Getting any sort of discounts on food is super exciting. But is this a good reason to get a discount on food? 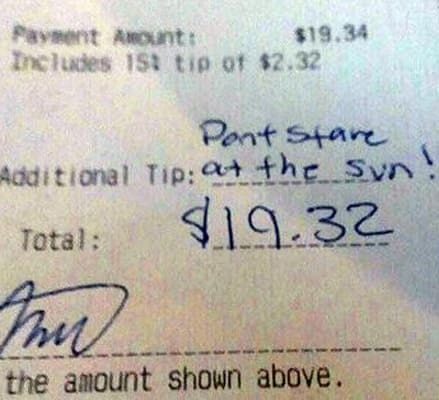 Sometimes you cannot think of all of the numbers, but this seems an odd way to tip a person. 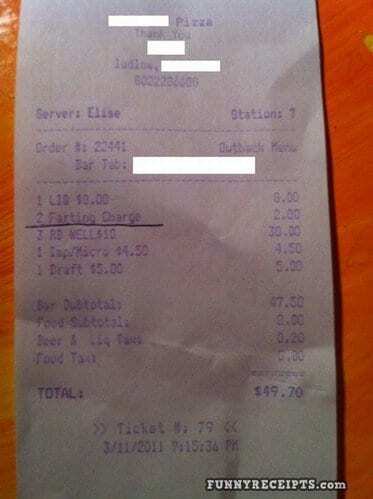 Let’s hope the server got their money! 31.) Does Anyone Ever Really Read This? 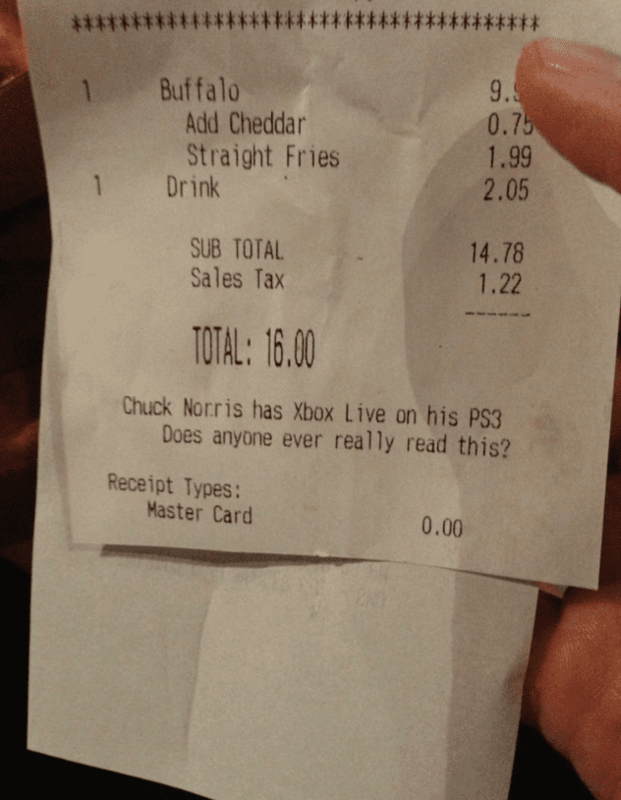 Chuck Norris jokes are some of the best one-liners that make us laugh really hard. 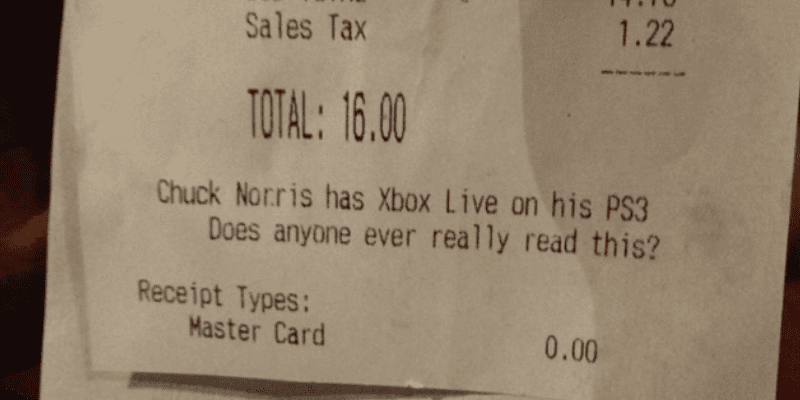 But the funniest caption on this receipt is the “Does anyone ever really read this?” Our answer: yes! They even go viral on the internet for the pleasure of all. This restaurant doesn’t use fire, they use ‘FIRE!!!!!!!!!!!!!!!!!!! !’ Huge difference, fellas. Being pregnant can be an exciting time for any woman! 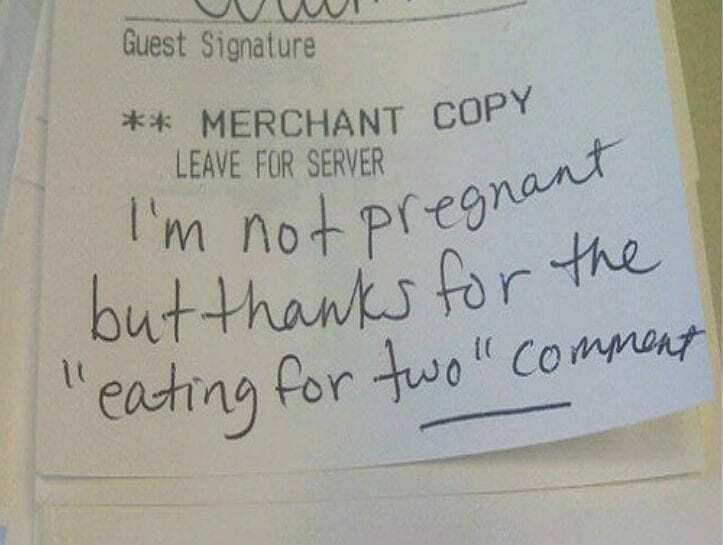 If she is not pregnant, it can be awkward, and also insulting. 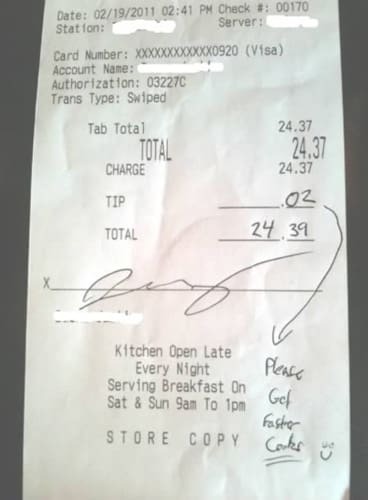 A tip for a server is money. No one should ever leave this kind of tip! 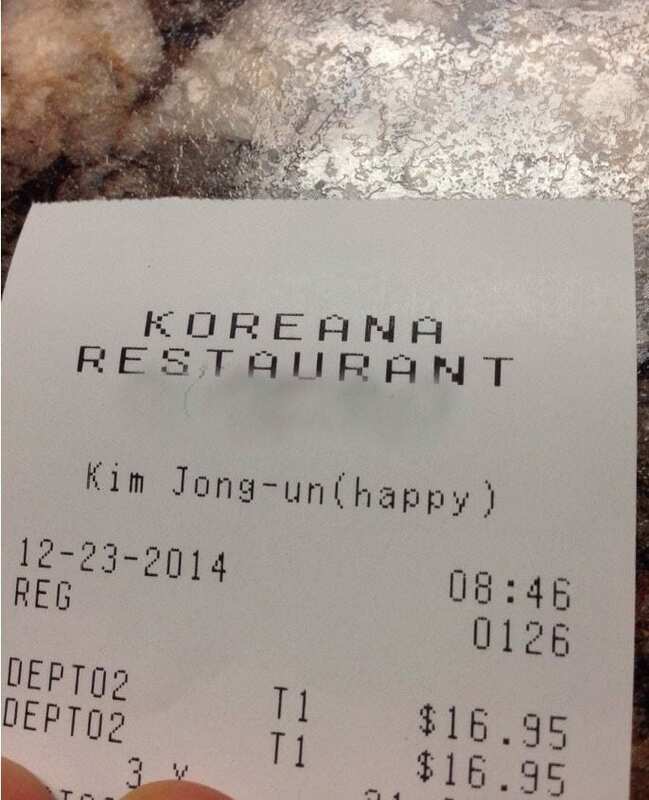 The user who uploaded this picture on Reddit said that all this restaurant’s receipts have this same caption on them. Imagine the confused look of customers who wonder who this George person is and whether they would enjoy a free burger if they came to the restauraunt naked on their birthday. We love companies that know how to appeal to their audiences. 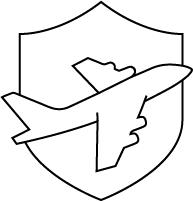 Sometimes, small details can blow the minds of their customers. 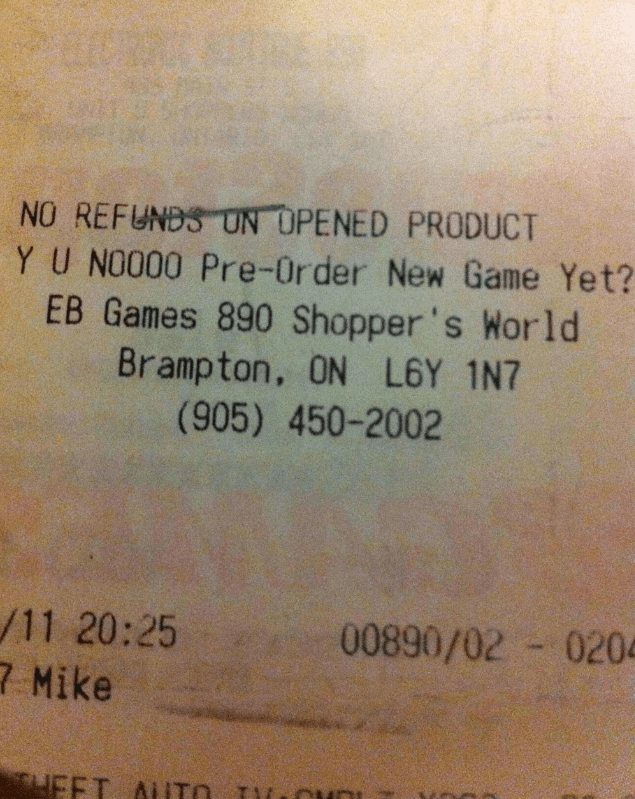 EB Games is apparently slaying this game. Read this in Flavor Flav’s ‘Yeah Boyyyyyy!’ to make it even funnier! This one isn’t from a restaurant, but there are some notes we can’t help but share with you. The person behind the counter of this bookstore was so chill that we low-key want to become their friend. Is their name actually Rapunzel, though? 23.) Oh, that’s nic… Wait, What? The Drinker of The Group is the real MVP. 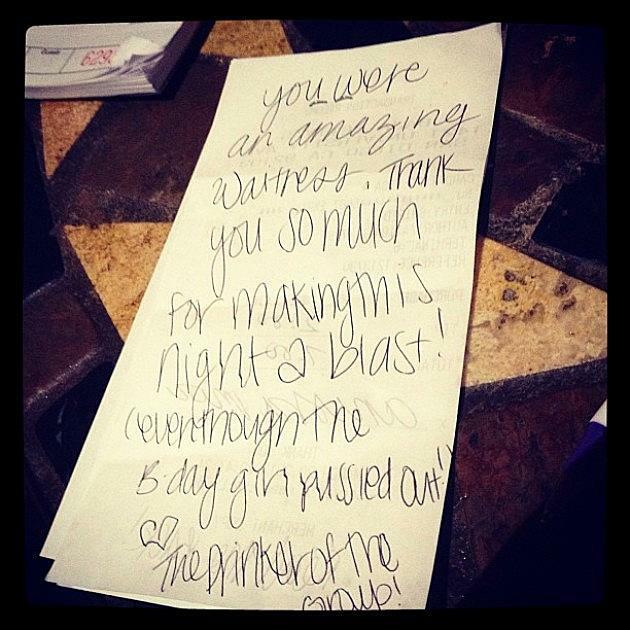 Even when drunk, they still managed to be nice and show their appreciation for the waitress. Thumbs up for you, stranger! And we hope the B-Day girl was fine after her night out! When you are a parent, it can be a wonderful time! But at this restaurant admits, this can be scary. When math isn’t your forte, taking a guess and rounding up to a higher number could be a way to go, especially if you’re feeling generous. If you have your phone on you though, the calculator app could be a real lifesaver. 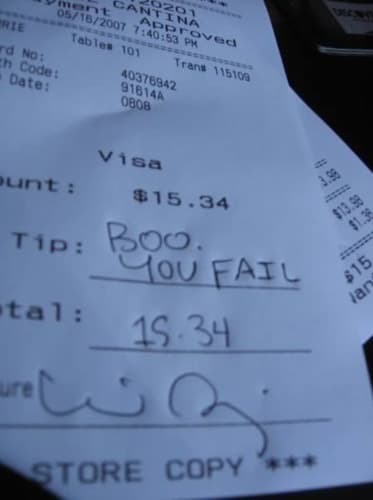 That way, you won’t have to leave these kinds of notes on dinner receipts. 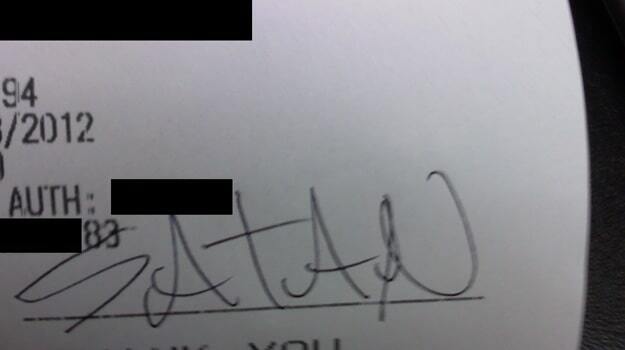 If this pizzeria charged this customer for a fart, then it was either a thunderous one or a repulsively stinky one. We just hope it wasn’t both. Garlic bread? Yes, please, always. No need to ask. 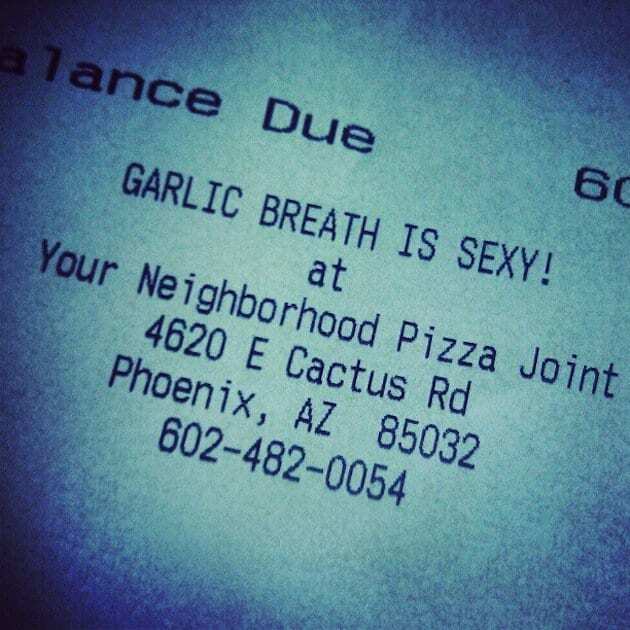 Garlic breath? No, thanks. We pass. 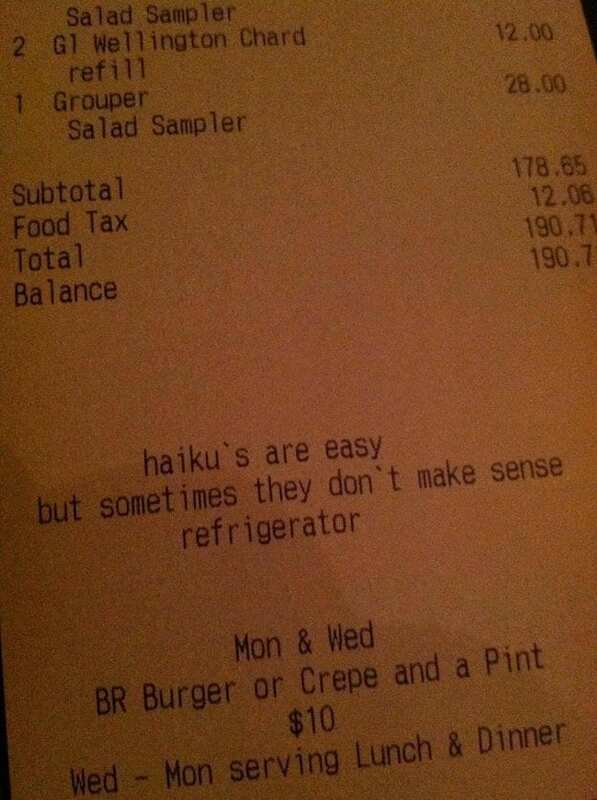 Haikus are usually poetic. They portray sceneries, sounds and stories to convey strong feelings. Other times, they just don’t make much sense. 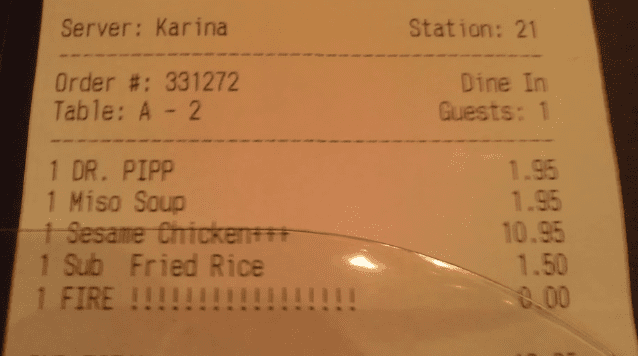 Especially when they’re on notes on dinner receipts. 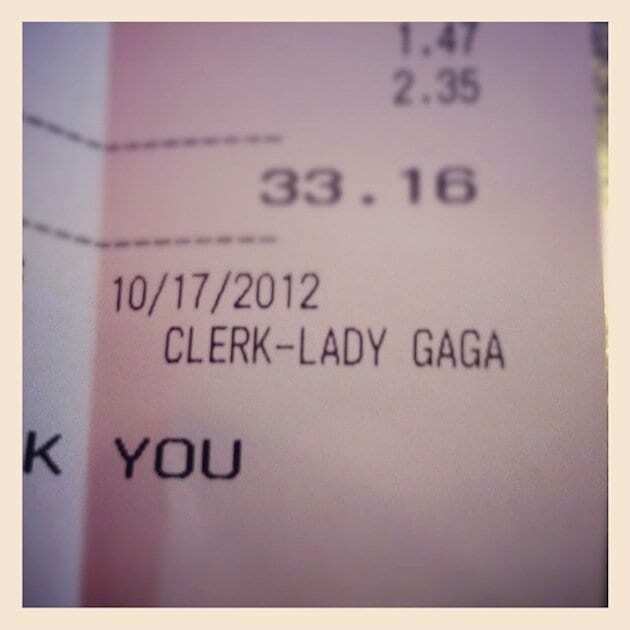 What would your reaction be if Lady Gaga was your waitress or counter attendant? I would probably send thousands of resumes to that restaurant until I get a job there too. It’s always nice to feel noticed, you know. 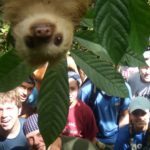 On the condition that the encounter remains respectful, especially if it’s with random strangers. 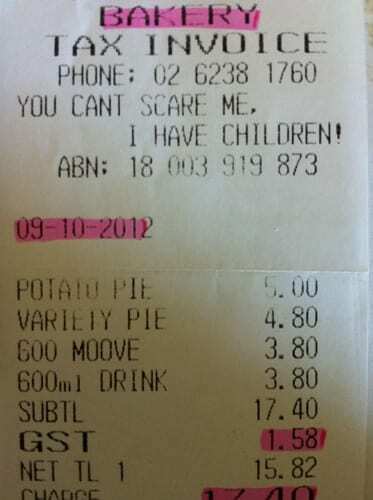 There are notes on dinner receipts that can come as a little bit creepy. This one is short and sweet. 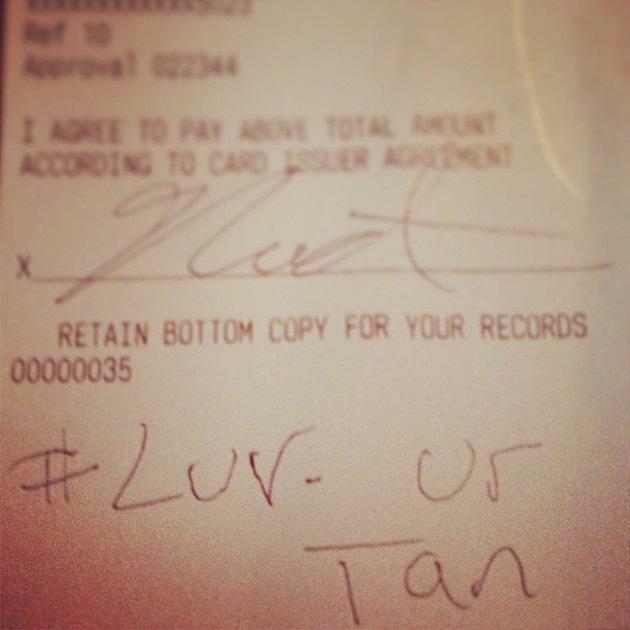 Leaving notes on dinner receipts will probably become our new obsession. You can make someone’s day only by writing a short joke, a thoughtful message or a fun doodle, just like this Pacman signature above! 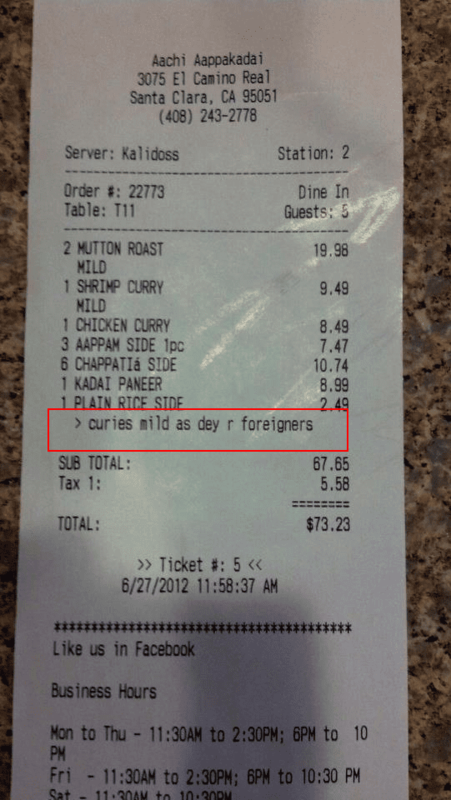 *Slow clapping* That’s a really cool note on a dinner receipt. Imagine if Keanu Reeves ordered something from this cafe, though. That would have been trippy. Kids can get pretty hard to manage in a public space. Especially if their guardians haven’t been firm on discipline and behavior in public. 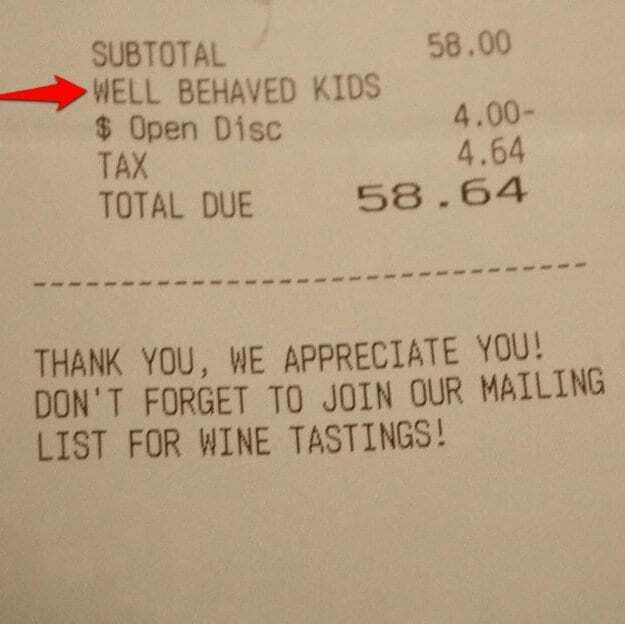 This is why a family with well-behaved kids sometimes deserves an extra tip. 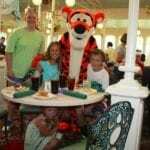 Take note parents, keeping your kids quiet could get you a few bucks off your bill! There are harmless typos that people don’t even notice. There are Starbucks-level misspelled names that are funny but still cute. And then there are names that should never be misspelled, like Bobby. Our taste buds aren’t all the same. Some people can handle spicy food, especially if their daily cuisine uses a lot of spices. Other people aren’t that fond of strong flavors, though. 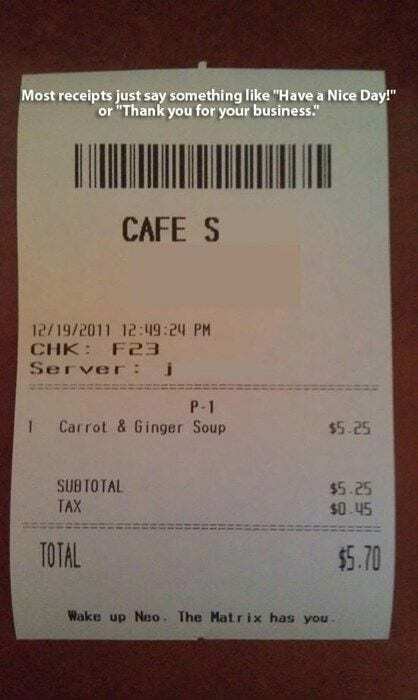 A restaurant that acknowledges that can save your meal. Imagine getting this after you finished serving someone. Hey, at least they fixed their mistake! It’s only a cent, but it’s the thought that counts! Getting a positive note like this is great to keep your night going well. The bacon tops it off! The way that they tell people they hate their job is hysterical. It’s okay to be unhappy. 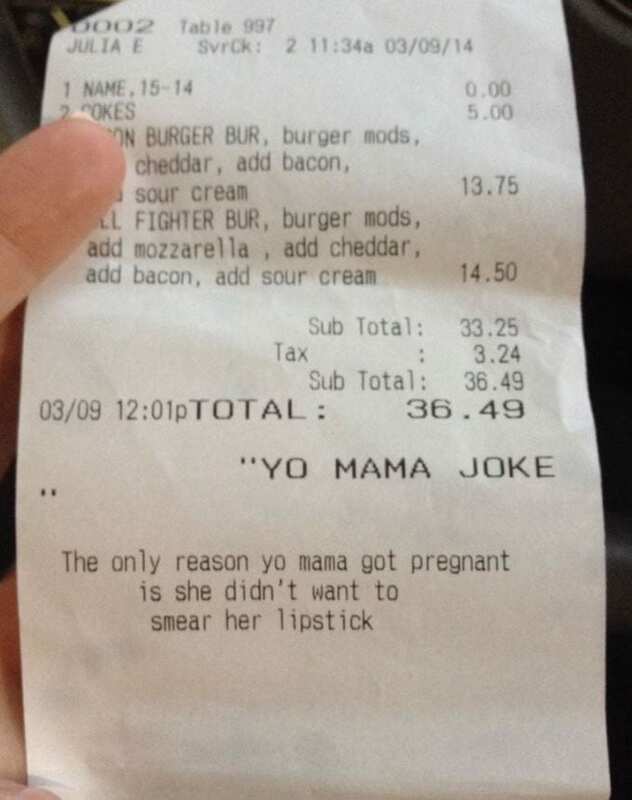 Did you know that Yo Mama jokes are still relevant? We thought it died out! 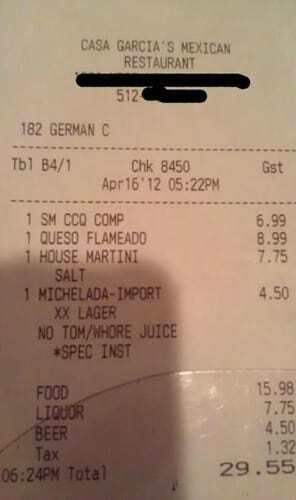 What does whore juice mean? Is it supposed to be an insult? Or something else? Why is Satan at the restaurant? Hopefully he enjoyed his meal. Wow, not sure if this was supposed to be punny or sarcastic. 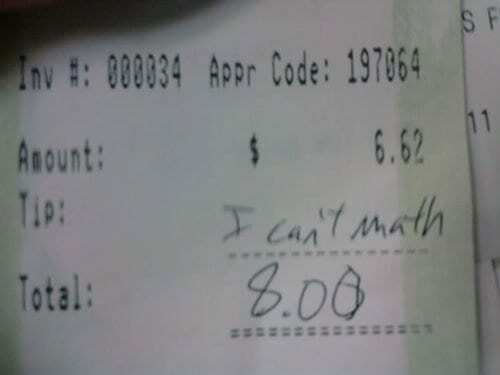 Anyway, giving two cents for a tip is not good. Hopefully they have a crappy day. Actually, being a server is a real job. Sometimes they work harder than most! 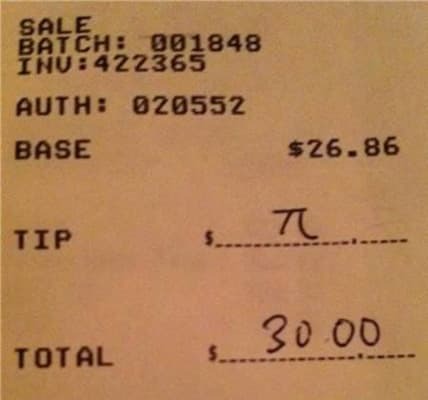 Remember, tip your server! 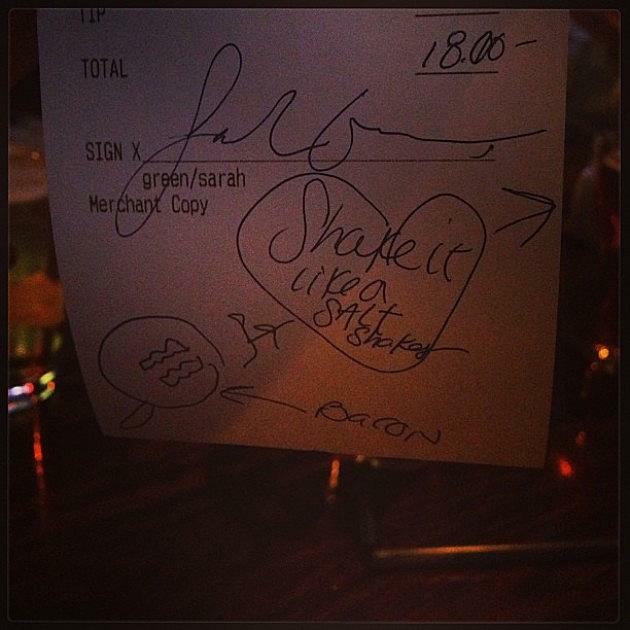 What do you think of these notes on dinner receipts? 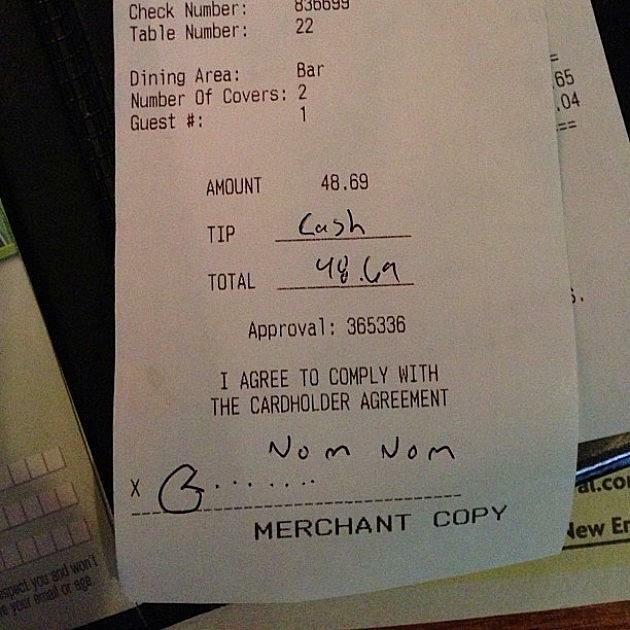 Have you ever received or wrote funny notes on dinner receipts? Let us know in the comments! 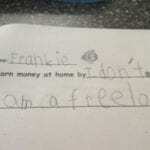 Also, have you ever seen the homework of a kid? Sometimes, these little bundles of joy write down the funniest and most random answers. We rounded up the 100 most hilarious ones in our next article!